This is a clear replacement body shell for the HPI Venture. This is not a complete model truck. 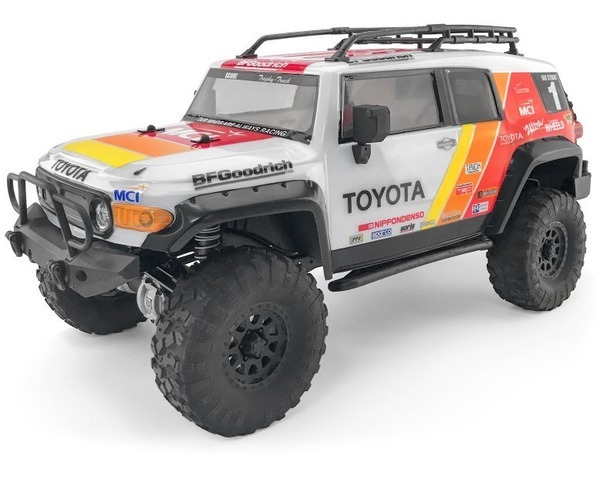 Like all HPI bodies, the FJ Cruiser comes with a clear protective overspray film, easy to use vinyl window masks and a large pre-cut decal sheet. The huge vinyl pre-cut decal sheet comes with all of the official Toyota and FJ Cruiser logos, headlights, tail lights, turn signals and more, plus a complete set of tinted windows, grilles, vents and more! Also included with the body set is the complete set of plastic detail parts including the replica roof rack and side mirrors! All the necessary hardware is included, from the o-rings and body clips for the roof rack to the screws for the side mirrors and tire mount.